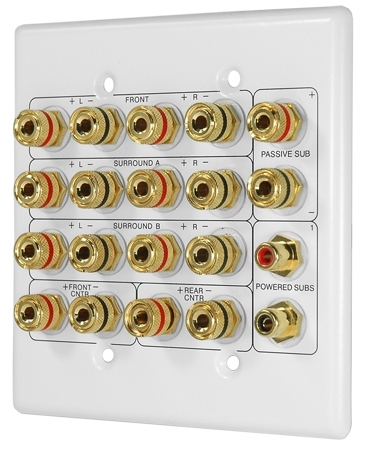 Keep unsightly wires and cables hidden when you set up your home theater system with the WP20 7.1 Home Theater Wall Plate available at Outdoor Speaker Depot. 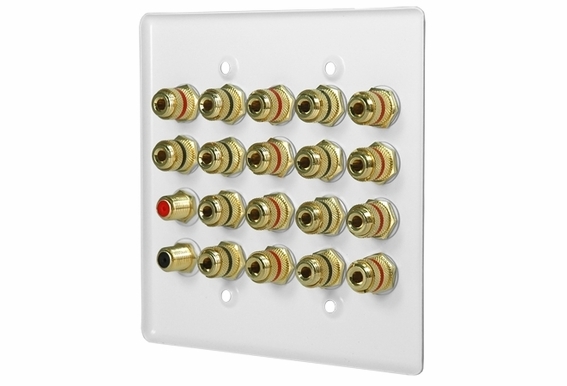 These wall played can be mounted to any part of a wall that can be drilled into where a cable is capable of being pushed through. It's a great solution for either a home theater or a setup with multi-room speakers. The package includes 18 gold plated binding posts which are color coded and can accept up to 14 AWG wire, banana plugs or spade lugs. It's simple to connect dual powered subwoofers with the two included RCA to F barrels, and the wall plates can take either powered or passive subwoofer connections. The wall plates are color coded in red and black. They fit a double gang J-box. Order from Outdoor Speaker Depot and it will ship within 24 hours on any business day. 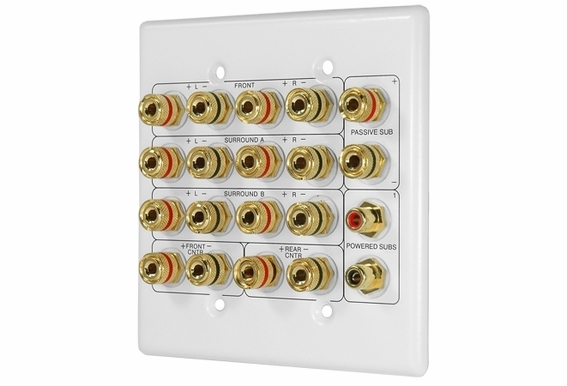 The WP20 Home Theater Wallplate provides the finishing touch to home theater or multi-room speaker connections. 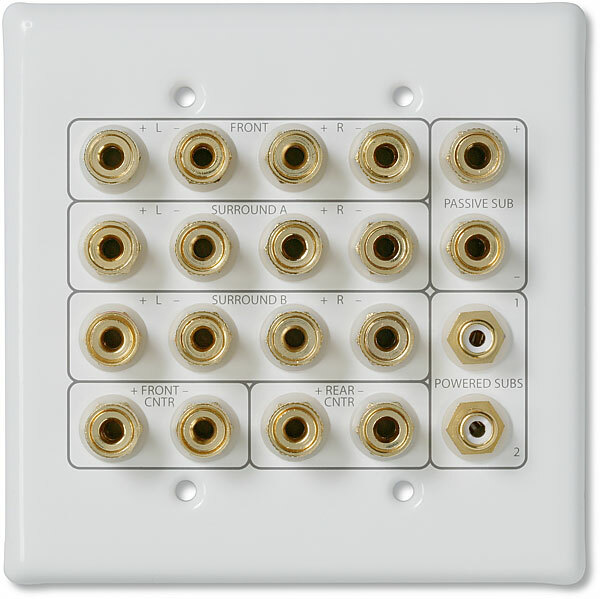 Terminate speakers for Dolby® 5.1, 6.1 or 7.1 systems with this double-gang wall plate. Eighteen gold-plated, color-coded binding posts accept up to 14 AWG wire, spade lugs or banana plugs. Two gold-plated RCA barrels make connecting dual powered subwoofers easy. 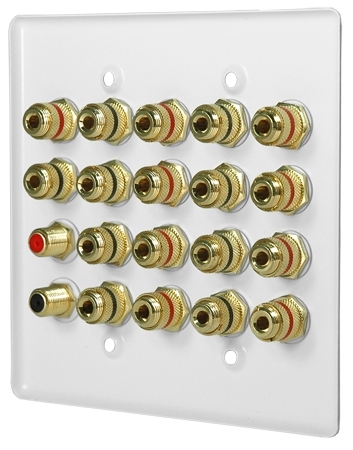 Can you order this wall plate with RCA connectors on the front and back instead of RCA on the front and F connectors on the back? Is a junction box required when installing a wall plate like this? Hi Tina, Not required, but you can use one. It is recommended to at least have a low-voltage mounting bracket however. Will the terminals support banana plugs from both sides at the same time - i.e. connecting both the wall and speaker wires with banana plugs from back and front to the same post? 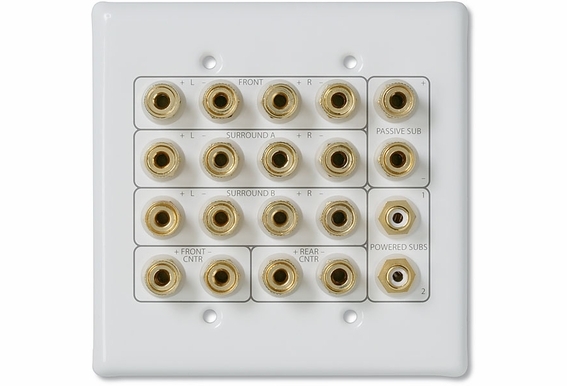 Also, I see customer feedback the standard 2-gang junction box outline may not be wide enough to fit the plate's connectors. Has someone used 2-gang socket successfully and can share its manufacturer/model? What are the f type connectors on this for? They seem to be in the place labeled for a RCA type subwoofer cable. Am I just confused or is there a different cable intended to be used?